(Bloomberg) — The U.S. economy is sprinting ahead of the rest of the world, at least for now. Spurred by solid consumer spending — including May retail sales that topped forecasts on Thursday — the U.S. is increasingly likely to rack up growth of at least 4 percent in the current quarter after a so-so expansion at the start of the year. In contrast, euro-area central bankers trimmed their outlook for 2018, while China showed signs of slowing, and emerging markets from Brazil to Indonesia have been buckling. That contrasts with last year’s picture of synchronous growth across the world, which has given way to uneven paths for major economies amid trade tensions and rising global oil costs. It also comes on the heels of diverging monetary-policy actions by central banks this week. The Federal Reserve raised interest rates on Wednesday for the second time this year, with Chairman Jerome Powell saying the economy is in “great shape.” Then, on Thursday, the People’s Bank of China kept the cost of reverse-repurchase agreements steady, defying predictions it would track the Fed’s hike. Hours later, the European Central Bank decided to taper bond purchases and pledged to keep interest rates unchanged at current record lows at least through the summer of 2019, a longer timeframe than investors had priced in. ECB President Mario Draghi pointed out that the recent economic “soft patch” may last longer even as he said the economy is in a better situation. In the U.S., the world’s largest economy, lower taxes enacted by the Trump administration, a strong labor market and elevated confidence are helping cushion the pinch to shoppers from higher fuel expenses. That’s bolstering prospects for household consumption, which accounts for about 70 percent of the economy. 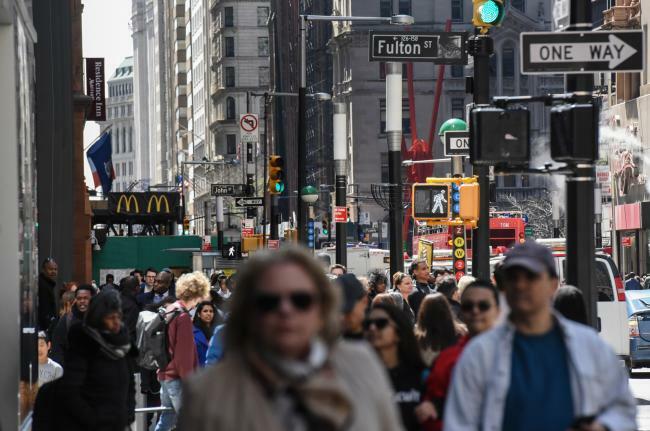 Retail sales, the latest snapshot of how U.S. households are doing, rose 0.8 percent in May, according to a Commerce Department report on Thursday. That topped forecasts and prompted IHS Markit to boost its projection for second-quarter growth to a 4.4 percent annualized pace from 4.2 percent. JPMorgan Chase & Co (NYSE:JPM).’s chief U.S. economist Michael Feroli pushed up his estimate to what he called a “boomy” 4 percent from 2.75 percent, while also lifting his forecast for annual U.S. growth. President Donald Trump is officially targeting sustained 3 percent growth but has often talked about an even faster pace. At the same time, some analysts see the pace of growth cooling in the second half and next year as the effects of tax cuts ebb, and many see the economy’s speed limit as closer to 2 percent. Meanwhile, the ECB’s updated forecasts for the euro area showed economic growth should slow to 2.1 percent this year, compared with its previous estimate of 2.4 percent. In China, the world’s second-largest economy, May data for industrial output, retail sales and investment all came in below analyst projections. Behravesh, of IHS Markit, expects global growth of 3.3 percent this year based on market exchange rates, with the U.S. making a 0.6 percentage-point contribution, the heftiest one among developed economies and just behind the 0.8-point contribution he’s penciled in from China. The decoupling by the U.S. follows an acceleration in growth last year across about 120 economies, accounting for three-fourths of world GDP, which the IMF described as the broadest synchronized global upsurge since 2010.